The AMD FirePro M2000 is a lower middle-class mobile workstation graphics card with DirectX 11 support. It is based on the same Turks-chip found in the Radeon HD 7600M series. Compared to the Radeon consumer line, the FirePro offers certified drivers for professional 3D applications. Due to optimizations and some unlocked features, the performance when using professional applications is more efficient with the FirePro M2000. The integrated 480 Stream processors of the FirePro M2000 are based on the new Terascale-2-architecture. The gaming performance is similar to the Radeon HD 7570M. Therefore, the card is able to run modern games (2012) in low details and HD resolution fluently. 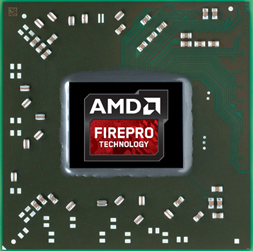 The FirePro M2000 also supports automatic graphics switching between the integrated GPU and discrete GPU. Called Enduro, the technology supersedes AMD's Dynamic Switchable Graphics and is similar to Nvidia's Optimus. Furthermore, the card can directly support up to 6 connected monitors using Eyefinity Technology if Enduro is disabled. The integrated HD audio processor is able to transmit HD Audio (TrueHD or DTS Master Audio) over HDMI and DisplayPort (e.g., for Blu-Ray videos). The power consumption of the M2000 is best suited for notebooks 14 inches or greater.